Presenting: The 2018 Incoming Cohort of Doctoral Students! Welcome to the 2018 incoming cohort! 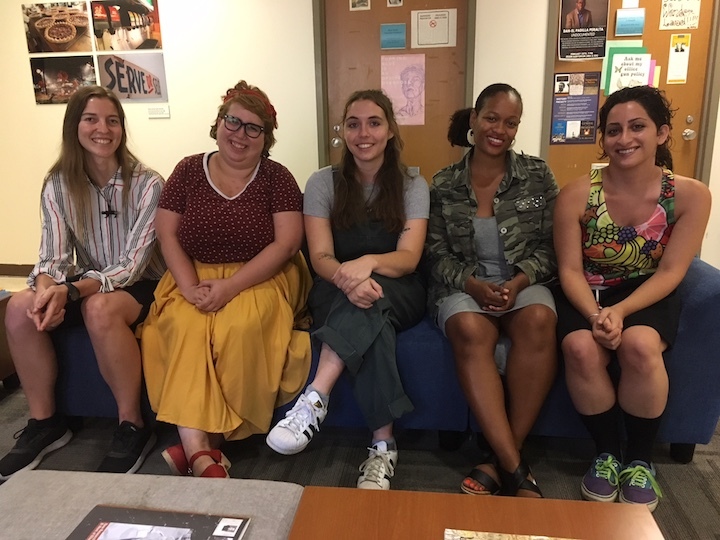 UT-Austin's American Studies doctoral program is delighted to welcome five new students this Fall, 2018: Ja'nell Ajani, Holly Genovese, Taylor Johnson, Bahar Tahamtani, and Kristen Wilson. Read on to find out a little bit about each student's academic interests, personal and scholarly background, and other passions and interests. Ja'nell N. Ajani is a first-year PhD student in American Studies. She graduated from New York University with an MA in Africana/Museum Studies and a MA in Studio Art Photography. Prior to beginning doctoral studies, she conceptualized and produced special events in partnership with institutions such as The Museum of Modern Art, Times Square Arts, Performa, The Brooklyn Museum, Schomburg Center for Research in Black Culture, The Studio Museum in Harlem, The Institute of Fine Arts at New York University, WBAI Radio 99.5 FM NYC, and the Africana Studies program in the Department of Social and Cultural Analysis at NYU, and NYU Florence. She also worked for NYU Abu Dhabi and NYU Shanghai as an administrator. Her current research interests include Modern and Contemporary Art, Commodification, Cinema and Media Studies, Visual Culture Studies, African-American Art and Art of the African Diaspora, Media and Performance, and Popular Culture. Chronicle of Higher Education, The LA Review of Books, Lit Hub, and many other publications. I am a huge reader-of literary fiction, young adult fiction, and other genres." to continually improve upon. I also like volunteering with the Inside Books project and Keep Austin Beautiful community cleanups and am hoping to get back into volunteer-DJing at KOOP radio. I’m very excited to return to academia and research - while I’ve enjoyed my time off, my greatest passion in life is learning and I can’t wait to restart my studies." the same movies over and over again." lifting weights, kayaking, playing videogames, cooking, and falling down research rabbit holes. I’ve also heard of Austin BBQ in legends and look forward to seeing if it lives up to the hype."